PREPARE TO FALL IN LOVE WITH THIS BEAUTIFUL 1 YEAR OLD HOME. WHY WAIT TO BUILD? THIS PREVIOUS MASTER MODEL HAS OVER $30K IN UPGRADES. LOVELY EAT-IN-KITCHEN WITH BEAUTIFUL GRANITE COUNTER TOPS, STAINLESS STEEL APPLIANCES, HUGE ISLAND, LARGE PANTRY, UNDER CABINET LIGHTING & MORE! SPACIOUS MASTER SUITE WITH GORGEOUS MASTER SHOWER. GENEROUS SIZED BEDROOMS. PLENTY OF LIVING SPACE AND CLOSET SPACE. HARDWOOD FLOORS, 9' CEILINGS, GAS FIREPLACE & SO MUCH MORE! NICE 1/2 ACRE LOT WITH BEAUTIFUL MATCHING SHED! SIDE ENTRY GARAGE WITH PLENTY OF PARKING SPACE. QUIET COMMUNITY IN A WONDERFUL LOCATION! Open House Date: May 4, 2019 from 2:00 PM to 4:00 PM. 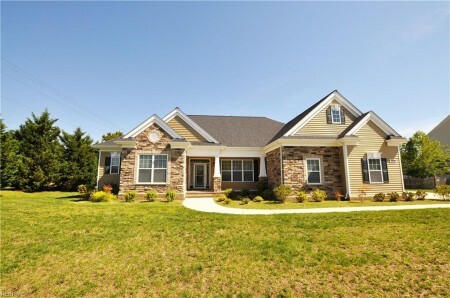 Send me more information about the listing at 2008 Fieldstone, Suffolk, VA 23434, MLS# 10252785. This 4 bedroom, 3 bathroom home located at 2008 Fieldstone, Suffolk, VA 23434 has approximately 2,579 square feet. It is currently listed for 444900.00 and has a price per sqft of $17,251. This home is currently Active under the MLS#: 10252785. It is listed by RE/MAX Prime. 2008 Fieldstone, Suffolk was built in 2017. It has Garage Att 2 Car, Multi Car, Off Street, Driveway Spc parking. The kitchen includes Dishwasher, Disposal, Dryer Hookup, Microwave, Gas Range, Washer Hookup. 2008 Fieldstone is part of the Pitchkettle Farms neighborhood located in 23434.